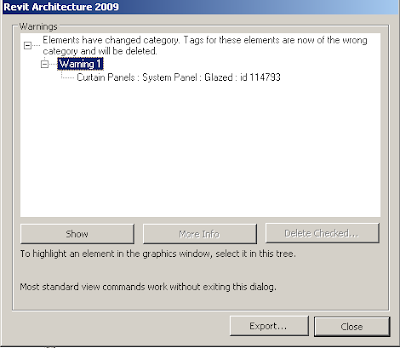 Revit Fix: Elements have changed category. Tags for these elements are now of the wrong category and will be deleted. Elements have changed category. Tags for these elements are now of the wrong category and will be deleted. This is one of the few errors where Revit does not let you delete the element to fix the problem. The error occurs when a curtain panel element which has been tagged; then is changed to a different category of panel. i.e. Door, Panel or Wall category panel. The common situation would be a tagged Door changed to a glazed panel. Switching the panel back to what it was previously won’t fix the error. There is a few possible ways to fix the error but the following will solve the error every time even if the panel is in a curtain system. In plan change the panel to a system panel. Select it and edit it. Select the panel again and delete it. The following error will appear: “Missing Curtain Panels will be replaced with System Panels to complete command.” Select “Replace Panel”. The new panel now won’t have any errors in it and you can now change it back to whatever panel it was before you started.